Ear infections in children (Otitis Media) are the most common illness for which antibiotics are prescribed. 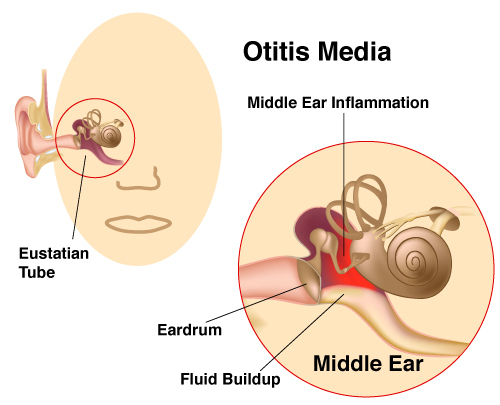 “Otitis” means inflammation of the ear, and “media” means middle. Anyone who has had a child with this problem knows how painful it can be. High fevers and lying down make the pain worse, making it difficult to sleep. Ear infections in children are often the result of a cold, which spreads and settles in the middle ear, and can be the result of both bacteria and viruses. Fluid accumulates in the middle ear, causing inflammation and pressure. Symptoms can include fever, piercing pain, trouble hearing, dizziness and fluid drainage. Ear infections can sometimes clear up on their own, but if symptoms persist for several days, see your doctor. In adults, Otitis Media can also be very painful. Prolonged ear infections can also lead to permanent hearing loss. If you experience hearing loss for any length of time, come in for a consultation. Yes, because of the severe earache and hearing loss it can cause. Hearing loss, recurring ear infections in children, may impair learning capacity and even delay speech development. However, if it is treated promptly and effectively, hearing can almost always be restored to normal. Otitis media is also serious because the infection can spread to nearby structures in the head, especially the mastoid. (see the symptoms list) Immediate attention from your doctor is the best action. What other Otitis Media treatment may be necessary? Ear infections in children may recur as a result of chronically infected adenoids and tonsils. If this becomes a problem, your doctor may recommend removal of one or both. This can be done at the same time as ventilation tubes are inserted. In young children, adolescents, and adults look for: earache; a feeling of fullness or pressure; hearing problems; dizziness; loss of balance, nausea, vomiting, ear drainage, and/or fever. Remember, without proper treatment, damage from an ear infection in children can cause chronic or permanent hearing loss.